by Bill Dwight on Monday, May 21, 2012 at 12:39 PM | LEAVE A COMMENT! Last week’s Wall Street Journal article, For $3 a Week: Buy Tops and Earn Interest, describes the allowance and chore strategy that Emily Pierce and Thompson Emah use to teach good money habits to their 7 year old son, Ryan Emah. After registering the family, Emily and Thompson will see a short series of blue help bubbles on the Overview page. The first will prompt them to add Ryan as a member of the family. 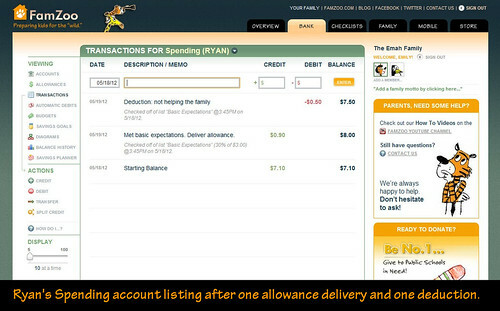 That way, Ryan will be able to sign into the “Bank of Emah” separately and check on his own accounts, savings goals, checklists, etc. 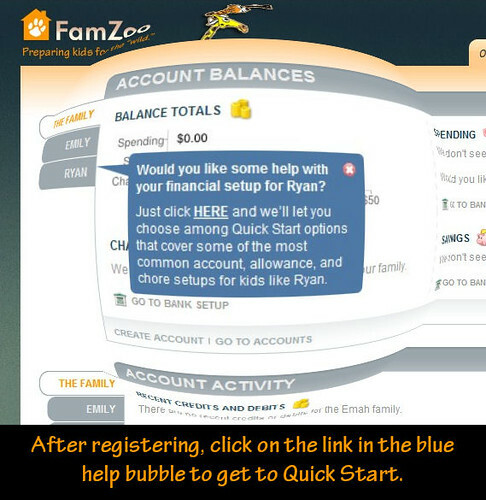 After adding Ryan, Emily and Thompson will see a blue bubble prompting them to head over to the Quick Start to get Ryan’s allowance and chore rules all set up. 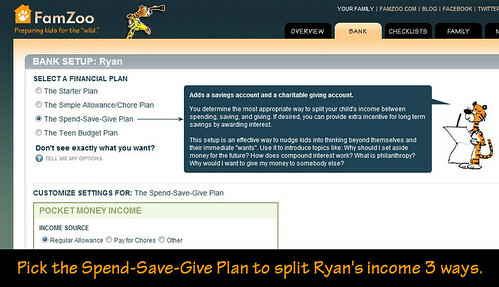 To match their three-way split policy for Ryan, Emily and Thompson can pick the Spend-Save-Give plan from FamZoo’s list of common configurations. Note: you can split any number of allowances between any number of accounts, but this three-way split plan is one of the most popular, so we’ve made it one of the handy defaults. 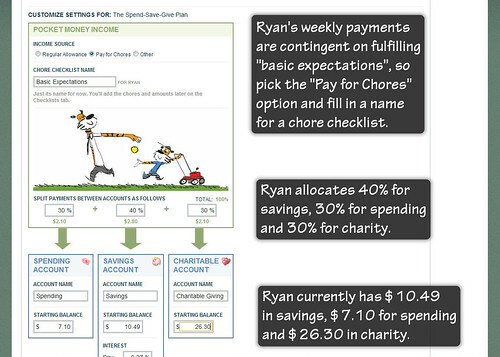 When Emily and Thompson pick a plan in the upper section of the Quick Start page, the diagram below updates to show how allowances or payments from chores flow into Ryan’s accounts. Emily wants the weekly $3 payment to be contingent on Ryan meeting “basic expectations” around the house. So instead of setting up an unconditional allowance, she can select the “Pay for chores” option and fill in the name for a chore checklist. The list will be used to track whether expectations are being met by Ryan. Payment will only happen when Emily checks off a box for the week. Within the upper income box, Emily can fill in the split percentages for each payment — in Ryan’s case: 30% to spending, 40% to savings, and 30% to charitable giving. Within each account box below, Emily can set the name and starting balance. Emily pays Ryan 28% interest on his savings so he can see it build up week to week, even though his balance might be quite low initially. She can use the Compound Interest Calculator in the Savings Account box to set the rate while getting a sense for how much she’ll be on the hook for in the future. She might want to ratchet that rate down as Ryan accumulates more savings over time! 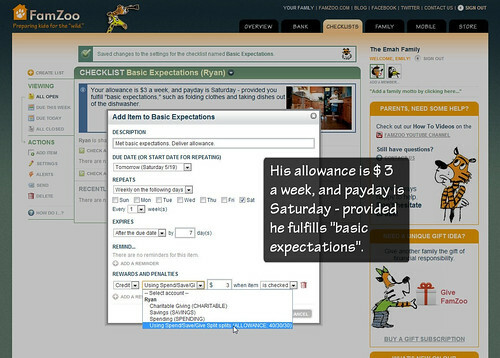 To make Ryan’s weekly allowance payments contingent on him meeting basic household expectations, Emily can head on over to the Checklist page where she’ll find the “Basic Expectations” list she created in the Quick Start. She can add a single checklist item that repeats every Saturday and only deposits a $3 payment if she checks it off. By choosing the Spend/Save/Give split entry in the drop down target list, Emily can automatically allocate the payment across Ryan’s accounts according to her desired 30%/40%/30% rule. 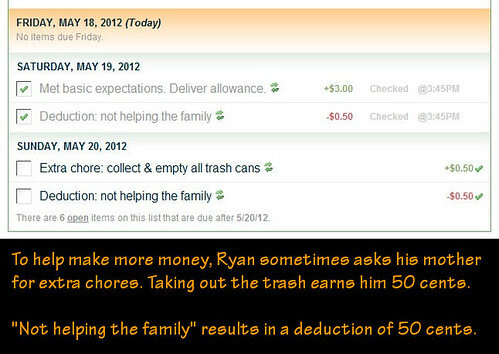 Emily can offer opportunities for Ryan to earn more money by adding extra work items to the checklist — like a 50 cent reward for collecting and taking out the household trash. On the flip side of the carrot/stick equation, she can also add an item for a 50 cent deduction that she can check off whenever Ryan’s behavior is deemed particularly unhelpful to the family. The history and running balance in each of Ryan’s accounts can be viewed on the Transactions page. The history will include deposits for allowance, extra chores, and occasional windfalls like birthday money from grandma & grandpa. It will also include a running record of withdrawals for purchases as well as any behavioral deductions. 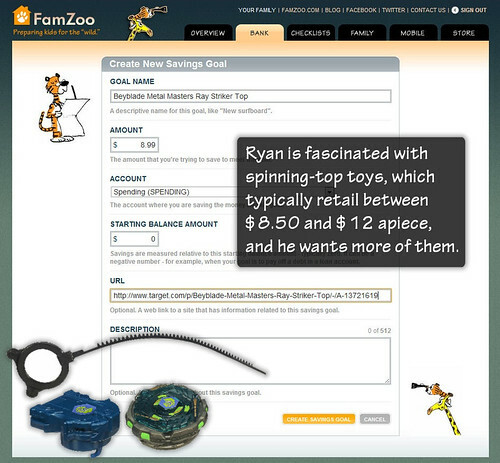 Ryan can make savings goals for the spinning top toys he loves. He can monitor progress toward his goal from his own dashboard. 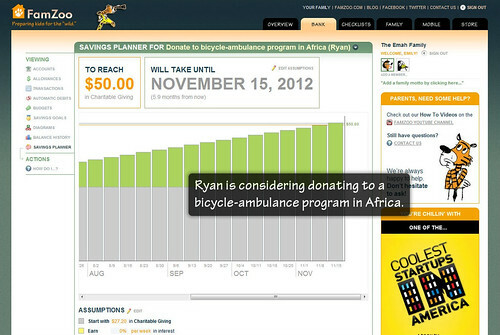 Ryan can see how long it will take to reach a savings goal — like the desire to make a charitable donation to a bicycle-ambulance program in Africa — by using the Savings Planner. If he clicks on the pencil to edit the savings assumptions, he can see how changing the amount saved, working extra jobs, or earning interest can change the end date. 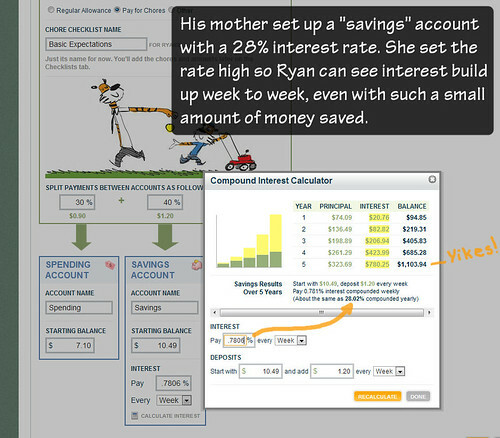 Ryan can see his account balances, his goal progress, and everything else at a glance on his “Bank of Emah”dashboard. 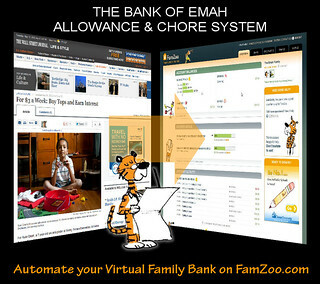 Ready to set up your own virtual family bank with your own policies? Don’t hesitate to contact us if you have any questions or need any help.